Taiwan's Lunar New Year is traditionally followed by warming weather, blooming flowers and spring rains. But those rains failed to arrive, strengthening the grip a persistent drought has on the country. Because of the drought, the country's Water Resources Agency under the Ministry of Economic Affairs (MOEA) has consistently been the bearer of bad news. First it was second-phase water rationing in nine cities and counties in western Taiwan followed by successive warnings about receding water levels at the country's reservoirs. In the north, Shihmen Reservoir's water level has fallen below 220 meters (the height of the water level above sea level), the lowest since the dam was completed in 1964 and perilously close to the 195-meter "dead storage" level when water can no longer be drained by gravity. The Kaohsiung area in the south is also struggling with drought. A CommonWealth Magazine reporter who visited the Kaoping River Weir in the first week of March found that the majestic river's water flow had been reduced to a trickle, and dozens of excavators were busy dredging the riverbed in three different locations. "We want to dig a temporary channel to direct the water to the right bank. Otherwise, it will be hard to get access to the river's water," says Lo Shou-chih, the director of the Kaoping River Weir administration, pointing to Pingtung County on the riverbed's left bank. The river's water flow had fallen that day to 11.9 cubic meters per second, a volume normally seen just before the end of the traditional dry season in late April or early May. From north to south, all of Taiwan is facing a water crisis. Even Vice Economic Affairs Minister Yang Wei-fuu, who is also acting head of the Water Resources Agency, says Taiwan is facing its worst drought in the 68 years the Central Weather Bureau has had rainfall stations to measure precipitation. In 2014, Taiwan as a whole got about two-thirds of its average precipitation, and its reservoirs received only 30-50 percent of the rain they would normally get. Every reservoir in the country, with the exception of Feitsui Reservoir in the Taipei area, suffered major water shortfalls. 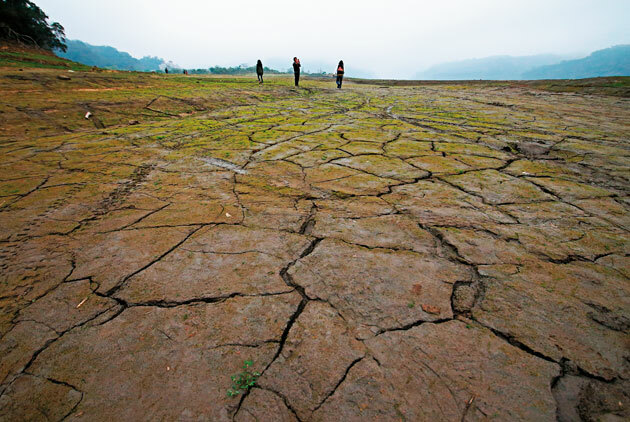 Taiwanese are no strangers to nationwide droughts, but they prefer to forget them. The last major drought occurred in 2002, when average rainfall totaled 1,500 millimeters, about 40 percent less than the 2,500 mm average. Shihmen Reservoir was close to the point of being unable to release water, and the capital Taipei faced third-phase water rationing in which parts of the city were without water on a rotating basis three days a week. "I went through that. So now when I think about it, I'm still very afraid," says President Ma Ying-jeou, who was the mayor of Taipei at the time. "When you open the faucet and no water comes out, it's hard to even bring yourself to cry. Everybody tries to get ahold of water because nobody knows when relief will come." In 2002, the water level at the main reservoir for Taipei, Feitsui Reservoir, fell as low as 120 meters, just 10 meters above the dead storage level of 110 meters. "We were a country that was facing a shortage. There was no room for the wasteful or extravagant use of water," recalls Ma, who could just as easily have been talking about this year. That year, the drought persisted until the Dragon Boat Festival when thunderstorms suddenly erupted during the traditionally dragon boat races, dramatically ending Taipei's plight. 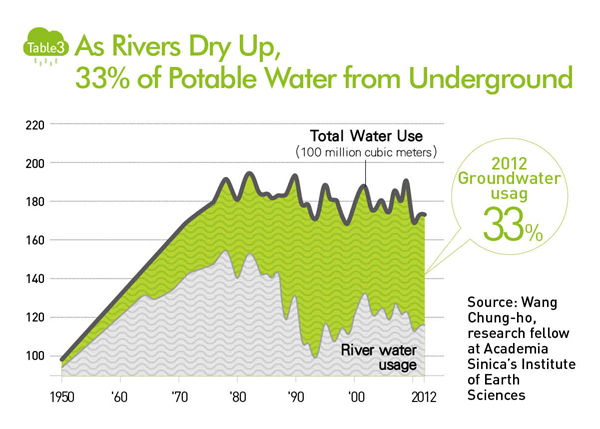 Around the world, "water" has become an increasingly pressing problem both because of shortages and excesses. At the World Economic Forum in January, the 2015 edition of the Global Risks report listed "water crises" as the top global risk in terms of impact, the first time water had occupied the top spot in nearly 10 years. Similar to Taiwan, Brazil, Australia, Russia, California in the United States and others are all facing serious drought conditions. "We are currently experiencing a huge shift. And the impact of that shift is something the Earth has never seen before," says Wang Chung-ho, a research fellow at Academia Sinica's Institute of Earth Sciences who studies how global warming is changing Taiwan's environment. According to the latest Intergovernmental Panel on Climate Change report, it used to take 5,000 years for the Earth's temperature to change by 1 degree Celsius, but that time span has been shortened to 150 years today. And the pace of warming is set to accelerate further, with the global target of a 2 degree rise by the end of century only attainable if CO2emissions are controlled below their current levels. "The pace of acceleration has almost reached a point at which it's impossible to imagine its impact on the next generation," Wang says. As global warming accelerates, arid conditions will persist, hurting agricultural output. Because of the decline in harvests, food exporting countries will have less to export, and importing countries will be desperate to secure supplies, setting off a mad global scramble for food. At the same time, however, rising ocean temperatures are expected to deliver extreme torrential rains, increasing the risk of severe flooding. According to a report titled Abrupt Impacts of Climate Change published by the U.S. National Research Council in late 2013, more people in Asia are exposed to floods than anywhere else in the world, and the number is on the rise, from 29.8 million exposed to floods in 1970 to an estimated 77.6 million in 2030. Taiwan finds itself swinging uncomfortably from one extreme to the other, as if bound to a roller coaster careening between great heights and sudden lows. 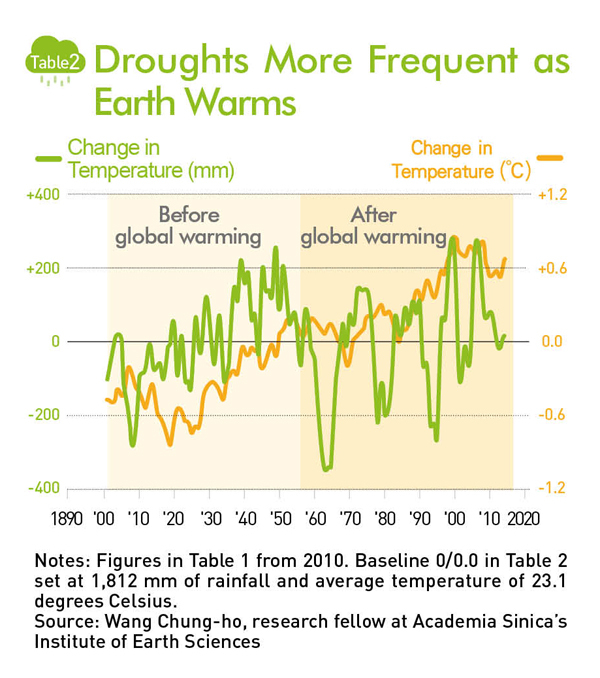 After compiling a chart showing Taiwan's average precipitation from 1901 to 2014, Wang discovered that periods of stable rainfall have become increasingly rare and droughts have occurred with greater frequency and with greater intensity since the Earth began warming in 1960. As the drought intensifies in parts of western Taiwan south of Hsinchu, drawing water from the Kaoping River is proving increasingly difficult. "We face drought conditions 31 percent of the time and torrential rainfall 13 percent of the time," Wang says, leaving only about half the year when Taiwanese don't have to fret about the weather. Though small in area, Taiwan itself is home to two very different climatic worlds –northern Taiwan and central and southern Taiwan. Average rainfall is declining in the southern two-thirds of the island but rising in the north, and rainfall patterns differ dramatically as well. The average number of rainy days per year has remained roughly at about 183 days in the north but fallen about 20 days from an average of 128 days in the rest of the country since the 1990s and by 40 days a year in the hardest hit areas. The intensity of rains in northern Taiwan has picked up, with any precipitation potentially turning into a torrential downpour, while drought perpetually hovers like a ghost in the skies over the central and southern parts of Taiwan. The uncertainty over how the climate will change in the future poses a growing risk to every country in the world. "Governments around the entire world, including in Taiwan, are facing new and irreversible trends," Wang says, with a world map on his computer showing that the major grain producing areas are all under serious threat. "Governments need to react quickly and with sufficient force." But has Taiwan reacted quickly enough and with sufficient force to its drought risk? "We have a lot of flood experts, but we don't have drought experts. The government will always respond simply by letting land lie fallow and rationing water," says Chen Chi-chung, a professor of applied economics at National Chung Hsing University who grew up growing red beans with his father in Pingtung County. Water is not only humanity's lifeline but also the lifeblood of a country's development. The World Meteorological Organization (WMO) warned countries in 2013 that droughts have a severe impact on water availability and quality, food security, economic growth, and national land development, and it launched a national drought management policies initiative to cope with the challenges. According to the WMO's National Drought Management Policy Guidelines, published in 2014, "a national drought policy should establish a clear set of principles or operating guidelines to govern the management of drought and its impacts." The essential elements of a national drought management policy include "developing proactive mitigation and planning measures, risk management approaches, and public outreach and resource stewardship," the guidelines say. They also urge enhancing collaboration between national, regional and global observation networks and developing information systems that improve public understanding of drought and preparedness to deal with its challenges. At the same time, the WMO guidelines recommend that authorities in each country create comprehensive governmental and private insurance and financial strategies to cope with drought. "But the government doesn't seem to be taking forceful enough action right now. There is no agency coordinating this effort," said one Cabinet official on condition of anonymity. Without common objectives and a clear organizational structure, "this area, frankly speaking, needs to be strengthened," the official said. The WMO guidelines put a premium on resource management, something fast-growing China has taken to heart, at least on paper. Beijing has drawn three red lines as core guidelines for developing new cities: 1) restricting the total volume of water supplied; 2) controlling water supply efficiency; and 3) managing water pollution at the source. Of the three red lines, putting a ceiling on the volume of water that can be supplied is the top priority, meaning that national land development starts from the perspective of water supply. But "Taiwan in the past has gone for economic development. So demand for water came first and then we figured out how to provide it," the MOEA's Yang admits. The Southern Taiwan Science Park stands out as a good example of the low priority given to water concerns when major projects have been developed. The park's site was originally a detention area that straddles the towns of Shanhua, Anding and Sinshih, and, consequently, the park floods easily and often lacks water, with a current shortfall of nearly 40,000 cubic meters a day. If other water infrastructure is not completed as expected by 2021, the water shortfall could expand to 270,000 cubic meters a day by then. "Although the Southern Taiwan Science Park is still one of Taiwan's cash cows, it has never been able to get out from under the shadow of water shortages," says former interior minister Lee Hong-yuan, who helped deal with the science park's flooding problems as the head of the water resources bureau under Taiwan's now-streamlined provincial government. Recent history has made it clear to local governments that water management needs to be the top consideration in any development strategies. The Taoyuan Aerotropolis project, which will involve the largest scale of land expropriation ever seen in Taiwan for any infrastructure plan, may face real water concerns because it is set in an area served by Shihmen Reservoir. The serious buildup of silt at the bottom of the reservoir has limited its capacity, and water shortages have grown increasingly serious and are expected to reach 390,000 cubic meters a day in 2016 and 460,000 cubic meters a day in 2020. "By then, the beautiful dream of the Aerotropolis will become northern Taiwan's biggest nightmare," predicted Lee. Even a desalination plant and a detention pond planned in Taoyuan by the WRA will not be enough to bridge the water shortfall. The disregard for water resources in land and infrastructure has resulted in desperate grabs for water by manufacturers and farmers whenever a shortage occurs, with the agricultural sector often suffering the biggest hit. More than 43,000 hectares of rice paddies, or about 11 percent of the total land used to grow rice in Taiwan, were left fallow for the first rice-growing season of this year because of the prolonged drought, triggering farmer protests. This problem also reflects the urgent need to reconsider national land use and adjust agricultural policy. Taiwanese agriculture has always been centered on rice varieties that consume huge amounts of water. Nearly 400,000 of the country's 600,000 hectares of cultivated land are devoted to the grain, supported by government price and purchase guarantees. "The government's system of price supports and purchase guarantees for rice has exacerbated the problem," argues National Chung Hsing University's Chen. The Council of Agriculture has launched a program to "activate fallow land" by encouraging farmers to grow less water-dependent crops on their land, and it raised the target for food self-sufficiency from 32 percent to 40 percent. But because the price and purchase guarantees for rice offer such big incentives, farmers continue to grow rice en masse, resulting in stored rice reserves accumulated through the programs of more than 800,000 metric tons. Manufacturers have also relied heavily on groundwater to keep their operations running, leading to heavy subsidence in Yunlin and Chiayi counties that has moved increasingly inland. "Based on past experience, after this year's drought is over, the pace of subsidence will probably accelerate," predicts a water expert, citing the excessive pumping of groundwater by factories and farmers to offset the lack of water from other sources. The serious subsidence is taking its biggest toll on Taiwan's high-speed rail line. 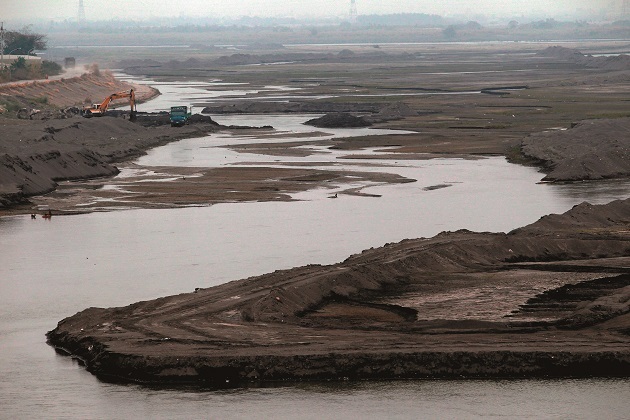 "Land in Tuku along which the high-speed rail line runs has subsided 130 centimeters, and the center of the subsidence, where the land is sinking at the fastest rate, is shifting inland in a northeast direction at the rate of a kilometer a year," estimates Academia Sinica's Wang. The Yunlin high-speed rail station expected to be completed this year will only be six kilometers away from Tuku in Huwei. In fact, in the absence of an overarching national drought management policy, the Water Resources Agency can do little more at present than improve the efficiency of water delivery. "Reservoirs have been built pretty much everywhere in Taiwan where they can be built, and desalination plants are closely bound by energy policy," says the MOEA's Yang, explaining the problems Taiwan faces in developing new sources of water. In addition, Taiwan's cheap water prices have made solving water problems even more difficult at a time when repairing or replacing leaky water pipes has gained urgency. Taiwan Water Corporation's replacement of old water pipes over the past two years has paid dividends, helping lower the country's water leakage rate from 25 percent to 18.5 percent during that time, and the water utility hopes to further reduce leakage to the world average of 15 percent by 2020. 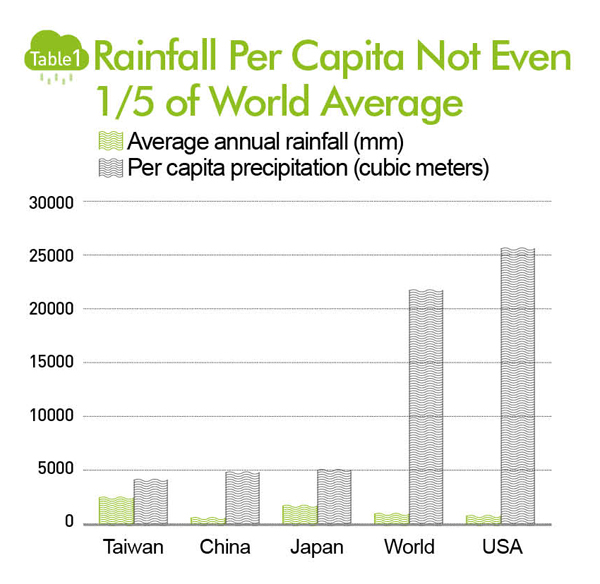 Ata more fundamental level, however, Taiwan needs to re-examine how water resources are allocated and managed. "The Council of Agriculture held a conference on how agricultural agencies should respond to climate change. A key conclusion was to reduce agricultural usage of water from 70 percent of the total to 55 percent," stresses National Chung Hsing University's Chen. "The problem is did we do it? Of course not." If Singapore Can, Why Not Taiwan? With Taiwan facing an arid future, technical improvements in water delivery efficiency amount to little more that stopgap measures. Singapore, which has long been dependent on Malaysia for water and food, invested heavily in water desalination and wastewater recycling businesses and developed vertical farms to improve food self-sufficiency. Taiwan should be able to catch up quickly by investing resources in building a national drought management policy platform. "That will require government determination and planning," Wang says, optimistic that Taiwan could turn the situation around in no more than five or 10 years. Nature has already rung the alarm bell several times, with Taiwan paying scant attention. Perhaps the latest drought will finally be welcomed by the country as an opportunity to put its water resources on a more sustainable course.